Have you ever imagined owning a house in the hills? Well, that’s what this place promises a home away from the home. 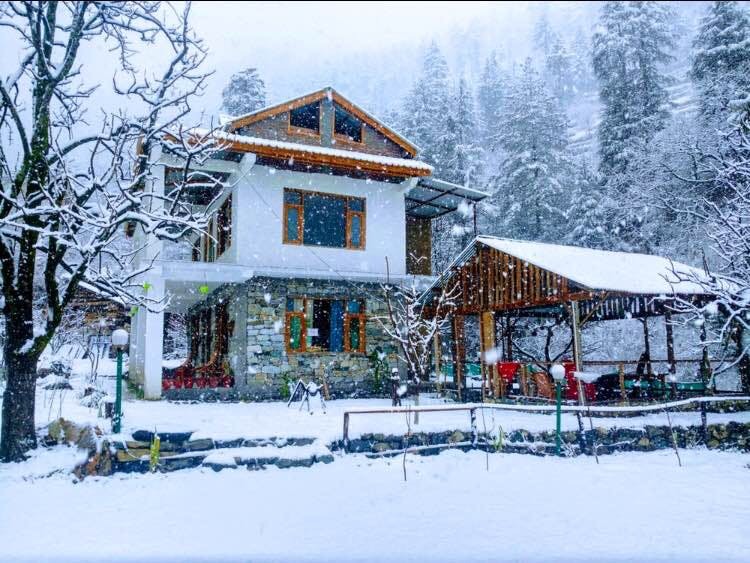 Jibhi, which is located 100 km before Manali, is an unexplored dream. If you are going from Delhi, you can take a bus to Kullu, and get off just before the Aut tunnel. From there you can take a bus or cab to Jibhi that would charge you something between INR 800 and INR 1000. The best place to stay when in Jibhi is the Jibhi homestead, owned by Ishan Thakur, who is a very sweet host. You can get in touch with him at +91-94184-90587 or +91-82191-90601. If you are here for a staycation, well you have found your spot. You can begin your mornings with the perfect sunrise by the stream, which can be witnessed just a few steps down the property. You can also indulge in a hearty breakfast, prepared by chefs in the in-house kitchen. The property also has a separate dining area with a hammock to where you can meet new people and connect with your old ones. You can choose your corner to read a book or listen to music, take a stroll down the lane and explore small cafes and nooks or just spend your night by the bonfire under the stars. If you are here to mix up, you can plan a visit to Jalori pass and trek up to the picturesque Serolsar lake. They have camping options and you can opt for trout fishing at the stream. If you are an enthusiast for killer views, hike further up the hills to have that view of a lifetime. Make sure you carry a warm jacket and good running shoes. Also, a short trip to the Jibhi waterfall is a wonderful way to spend your day. The place also has a lot of for architecture lovers. A stroll to the village of Chaini, will take you to a 1500-year-old watchtower of Chaini fort and plenty of hills that is admired for the architecture and views. While you are there, try their local delicacies, one of them being Siddu, a bread version of momos with a spicy as ever chutney. It is one of the quietest places in India, away from hustle bustle of cities. Once you are there, you will feel like you have the whole place to yourselves, and not just the room, stream, and streets.